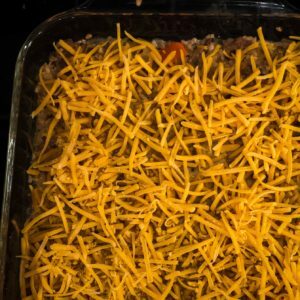 When I was little, our whole family just referred to this as “my casserole,” because it was my absolute favorite thing to eat for dinner. As kids, my brother and I each had our own signature dish that we requested for special celebrations. 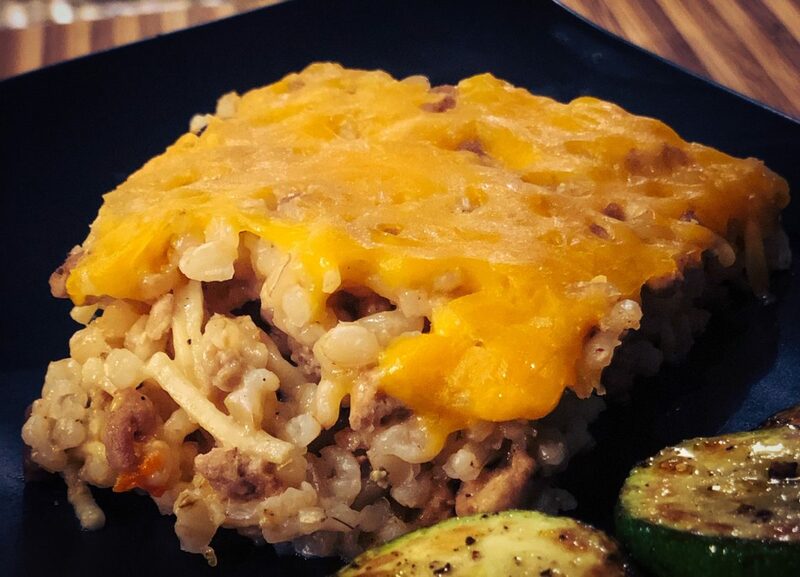 My brother always wanted my mom’s goulash, while I’d always beg for “my casserole.” Now that I’m older, I realize “cheeseburger & rice casserole” probably made more sense, but what fun is an impersonal name like that?!? So MY Casserole it is! I’ll worry about points for creativity on naming other recipes. Now, about 10 years ago, when I learned that brown rice was a bit healthier than white rice, and that ground turkey was a leaner substitute for ground beef, I decided to give this childhood favorite a little makeover. Luckily, these little swaps don’t compromise the warming comfort of this childhood treasure. They do, however, make the appearance…well, um…brown. This casserole isn’t fancy. It doesn’t look particularly appetizing. Whenever I’ve made it for loved ones in my life, I’ve issued disclaimers before serving it: “Don’t let the appearance of this throw you off, I promise it’s delicious!” Or maybe, “Okay, so it looks like brown mush, but it was my favorite meal as a kid.” I’m inevitably met with a raised eyebrow. But that skepticism melts – just like the cheesy goodness on top – with every first bite. This turkey, cheese and rice casserole is what I crave when I need a meal that will softly nestle into every corner of my belly. It’s what I make for friends and family when I think they need some nurturing comfort. It’s what you should make for dinner. And if you want to tell your friends and family that it’s “your” casserole, that’s fine by me. 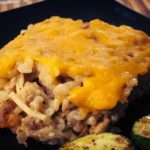 This Turkey, Cheese and Brown Rice Casserole is a healthier take on my childhood favorite Cheeseburger and Rice Casserole. It’s easy, nourishing, and the ultimate in comfort food. Choose baking dish. I use a 9×13 glass baking dish. A deeper 8-inch round or square dish also works. If you wish, lightly grease baking pan with a little butter or cooking spray. This will make cleanup easier. Cook rice according to package directions. I often buy rice from bulk bins, so for brown rice, I usually follow this process: Rinse rice well. Combine 1 ½ cups rice with 2 ¾ water in a rice cooker and cook until all the water has been absorbed. The same method also works over the stove top. Combine rice and water in a saucepan, bring to a slow boil. Lower heat to barely a simmer, cover and cook until all water has been absorbed. Fluff with fork when done and set aside. Place medium-large sauté pan over medium-high heat. Add turkey, sprinkle generously with salt and pepper. 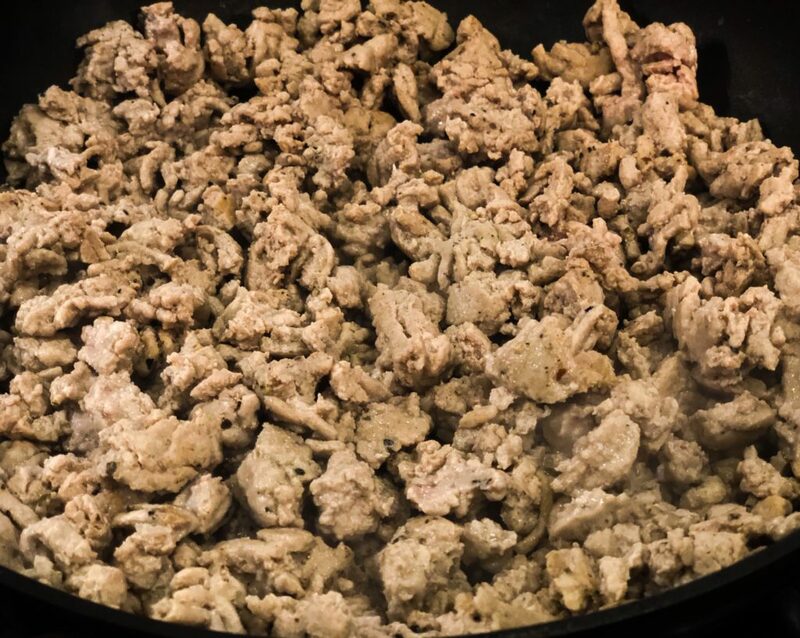 Using a spatula, break up into pieces and stir meat until all sides are lightly browned and no pink remains. Once cooked through, remove from heat and set aside. 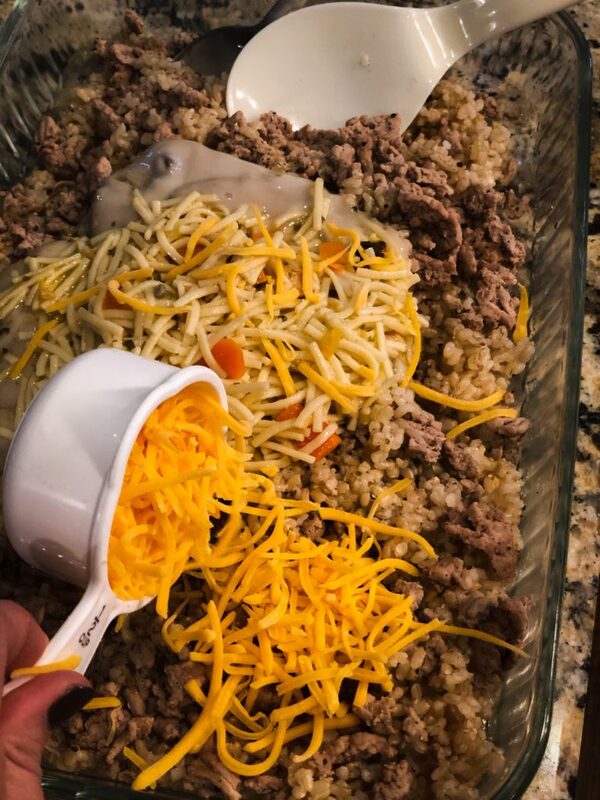 In baking dish, mix together rice and ground turkey until evenly combined. 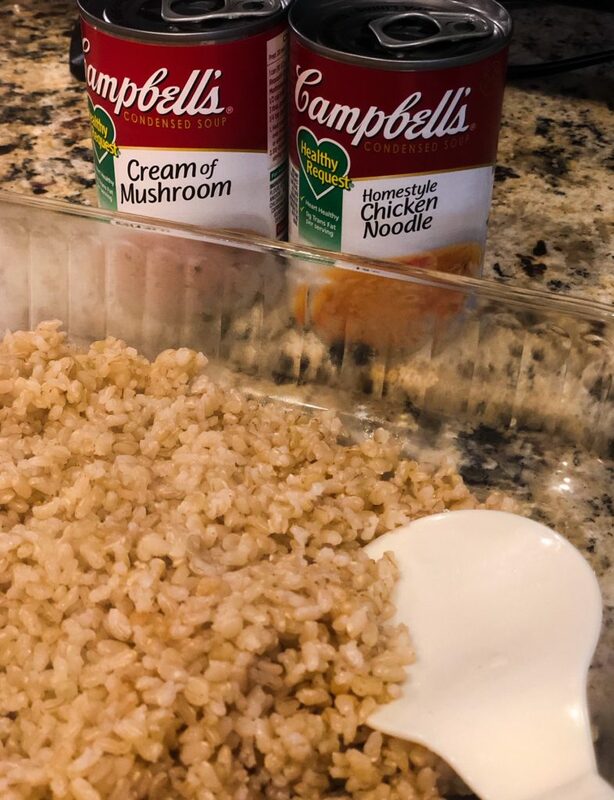 Add contents from cream of mushroom and chicken noodle soup cans, ¼ tsp salt, ½ tsp pepper, ½ cup of the shredded cheese and about a ½ cup of the milk. Stir together to combine. Mixture should be well-incorporated and look wet, but not soupy. If it seems a little dry, add remaining milk and mix well. Bake at 350 F for 20-25 min, until edges start to bubble. Top with remaining 1 ½ cups cheese and bake 5-10 min more, just until cheese has fully melted. Allow to rest for 5 minutes before serving. Enjoy! Picky Eaters: If you are making this for kids (or even adults) who don’t like the sight of mushrooms or any of the other soup contents in their food, feel free to blend up the soups to puree those ingredients into invisible oblivion. You’ll still get the great taste and your picky eaters will be none the wiser! Feel free to add some of the milk to the blender if that helps the pureeing process. Serve with: We always ate this with green beans when I was younger. As an adult, I think it’s also lovely accompanied with some simple steamed broccoli or sautéed zucchini.